Want to work in space? Are you looking for a workplace that allows you to work in an international and interdisciplinary environment that allows you to tackle challenging assignments together with skilled and enthusiastic peers? Are you passionate about solving complex technological problems? Are you interested in a career in space? If so, you will find working at ISIS a highly rewarding experience. Join ISIS' growing teams and help us to continue to be at the forefront of breakthrough concepts in the small satellite world! At ISIS we bring together, skilled and creative people to work in a multidisciplinary environment. We like to hire, develop and retain the best talent and skills, irrespective of your origin. Our people come from all over the world, including senior management. At present we have more than 20 different nationalities working for our group. Spacecraft engineering offers complex problems for bright people. Especially in our domain of small satellites, our engineers are challenged to find innovative ways to obtain maximum performance out of as little resources as possible. The multidisciplinary aspects of satellite engineering force you to think outside the box and consider a full system's view in order to solve the engineering challenges. Above all, ISIS is a company with a lot of dedicated people that are fun and pleasant to work with. We are a very down to earth organization while at the same time being a global leader in the field of nanosatellites. "One of the most rewarding professional experiences within the company is to be able to participate in all phases of a mission: from phase 0 up to launch and even during operations." "The things I enjoy the most are working with a good and friendly team and working on advanced hardware that will be used in space." "(Besides the people, of course!) I really like the variety of projects and mission types. It’s awesome to see a project develop from start to finish. One of my favorite rewarding moments was getting to load a CubeSat into its deployer, say goodbye and close the door, knowing that the next time it opened it would be in space! (And then hearing from it again was also nice )." "What I like the most here is the freedom. Pro-active people really have the possibility to take action and change things. At ISIS you can really see the value of your work and you can very easily have a visible impact on the projects. It is very rewarding!" "I like that the company is relatively small, which means you get to know all your co-workers and that your contribution to and impact on projects is relatively large. More importantly, I love the variety of cultures and personalities of the people from all over the world that I get to work with at ISIS." We greatly encourage new ideas and are open to suggestions from all employees on how to make ISIS a better company and how you can play a role in that. We promise not just a job, but a career. A career at ISIS means working in a very stimulating and challenging environment and allows you to develop yourself in a variety of roles. ISIS offers a broad range of personal training or skills development opportunities that can be tailored to your needs and interests, as well as a number of courses and training aimed at the entire organization. Examples of training and courses include Space Systems Engineering, PRINCE2 project management, Leadership development, and RF measurement techniques. In addition, it is very much encouraged to be involved in a support role within the company next to your main role, such as providing assistance in business development, process definition or technology road mapping. Even if there are no specific job openings or internships posted on our career page, we are always on the lookout for talented and passionate people. We strive to build up a balanced team of specialists and generalists, juniors and seniors in our various specialized teams (Space systems engineering, mechanical engineering, embedded software, RF and electronics engineering, attitude and orbit determination and control, and assembly integration and test). In particular, experienced assembly technicians, AIT engineers and embedded software engineers with small satellite experience are always welcome to apply. 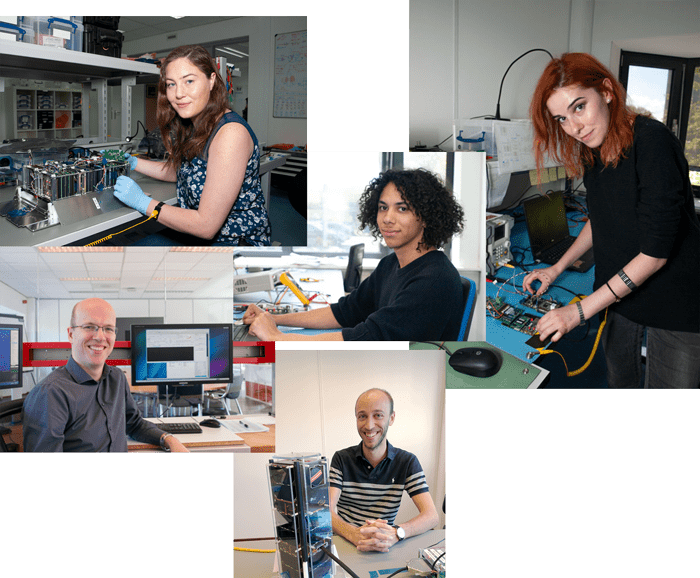 So, if you do not find the job you are looking for among our current vacancies or internships, you can always send us an open application at recruitment@isispace.nl.